EWS Admission Result 2018-19 1st admission list will be declared on March 7 according to the DoE officials. The admission process under EWS/DG category for the session 2018-19 will begin from January 22 and the last date to apply online through Edudel.nic.in is February 21. The first list will have the names of the children who have been selected or those who have been placed on the waiting list. EWS Admission Result 2018-19 2nd admission list will be declared on 3rd week of March. For General Category, the admission was begun on December 27 and the last date to submit the online application form is January 17. First, Second and Third Admission List will be declared on 15th of February 15, 28th of February and March 15, respectively. Applicants belonging to economically weaker section and the disadvantaged group can apply for admission under EWS/DG Category through the official website of DoE www.edudel.nic.in. Other category applicants are required to apply under the general category for online admissions in Nursery, KG and Class 1. Delhi Nursery Admission 2018-19 process is in its final stages. Only two days are left for online registration. If you are willing to apply for KG Admission in Delhi 2018-19 than you must apply as soon as possible to avoid the last minute rush. 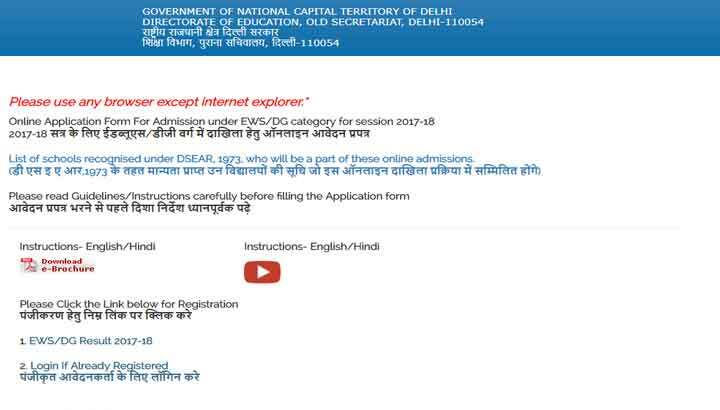 EWS Form 2018 for EWS Online Registration in Delhi Schools for the session 2018-19 can be downloaded from the given link. There are many schools who have received more than 1000 application forms for just 100 seats. After the application process is over schools will start the work of sorting of forms. Admission will be given to those applicants who will be fulfilling the admission criteria. The parent whose form has been canceled for some reason, cannot apply again for admission process in the session 2018-19. There are various criteria which need to be fulfilled for KG Admission in Delhi 2018-19. Applicants must follow the certain guidelines issued by schools before applying online. Here are the detailed instructions for EWS Admission 2018 . If you have a suggestion in mind or you want to ask a question, you can send us your query through the comment box below.